Writing a bit later than usual today, as it’s a public holiday in Malta. (One of fourteen, in fact, including Christmas and New Year’s, but who’s counting?) 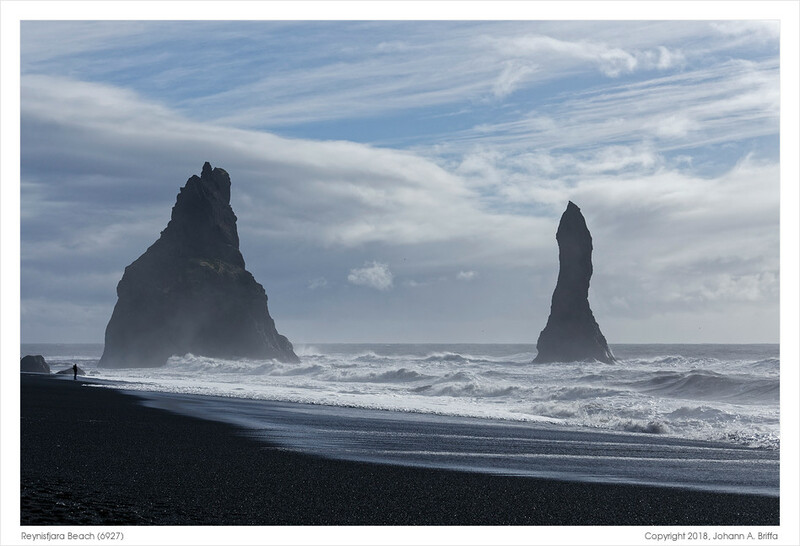 I’m sharing a photo from a stop in Reynisfjara beach, well-known for its black volcanic sand (and a major tourist spot for that reason). Just like nearby Vík í Mýrdal beach we were told to stay well away from the water line. Something that the person in the photo clearly ignored. His presence there does give some sense of scale to the place though, and how rough the sea was. Otherwise with natural landscapes it can be hard to tell. These are in fact the same sea stacks in the photo that I shared last week. Of course that was from a very different perspective, so one can be forgiven for thinking they’re not the same.